It has been getting on for three months since my last Trumpwatch installment (see here) although I did blog since then in response to a challenge laid down by a friend to reflect on why so many are against Trump (see here) and on the anti-climaxical ending to the Mueller enquiry (see here). I wonder if it is because Trump is actually winning, having withstood all that the swamp could throw against him, although a more obvious explanation is there is much to write on another controversial subject, Brexit. Now the Mueller enquiry has proven to be a nothing burger, Trump can support Attorney General, William Barr’s threat to investigate Spygate, part of his long awaited undertaking to drain the swamp, which methinks despite hiccups on the way and getting it wrong, e.g. an apparent indifference toward Julian Assange, has been long ongoing. But the Trump phenomena continues to intrigue, e.g. by the BBC, given the number of items they have run since he became President trying to figure out why Trump is so popular and can still come up smelling of roses despite all the s*** that is thrown at him. The latest was when two days ago the Today program interviewed the highly acclaimed historian, Victor Davis Hanson, author of the book “The Case for Trump”. What I appreciated listening to this guy were his lack of histrionics and spin, his deep insights, and his having learned the lessons of history in a way I don’t get with most interviewees. 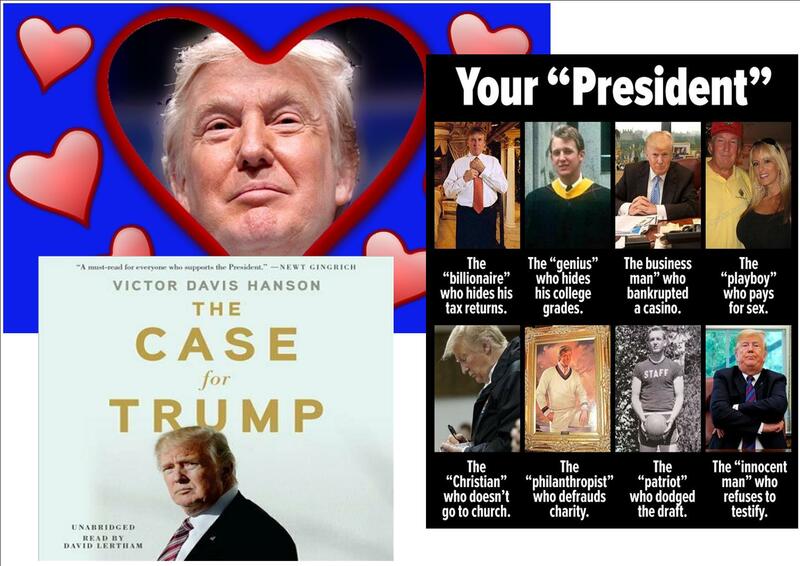 While some will dispute his conclusions there is little doubt that Hanson is well read and has thoroughly researched his subject, concluding there are good reasons for Trump’s popularity, who has done a good job, made many good calls and addressed the hopes and concerns of “deplorables”, let down by the political class. I confess that I spend time every day reading though posts on my Facebook timeline. A good many are about Trump, and likely over a half of these are negative, and this despite having more pro-Trump friends than is the norm. Today, for example, there is hit piece arising out of Trump’s criticism of Congresswoman Ihan Omar, who has received threats of violence, allegedly as a consequence of Trump’s tweets criticizing her, a discussion over a meme arguing that Trump is actually ungodly (unlike that nice real Christian, Jimmy Carter), with “friends” wading in and, given the thoughts that may arise if one were to consider image above, most declared there is a compelling argument for saying he is NOT godly, and criticism of his recent presidential veto to a Congress Bill that would have withdrawn US military assistance to Saudi Arabia because of its attacks on Yemen. All three examples could give rise to a lengthy debate and more delving, but this has to be saved for another time. Long ago, I nailed my colours to the mast that Trump, on the good to bad/mad spectrum, is nearer the good end (see here), and like Victor Davis Hanson, and notwithstanding his multitudinous faults, I can see a compelling case for Trump. In the words of another American President, Ronald Reagan, who the clever clog, know alls couldn’t figure out either: “You ain’t seen nothing yet”, for while he has made some bad decisions he has made good ones that will be seen to be good too that will deeply impact the world. The words of a well known hymn also come to mind: “And the Dance goes on”!